Title TBD. Watercolour, 8 x 8"
"Seen from the Highway", watercolour, 8 x 8"
I'm trying to get back to the studio after a bit of a break. There are several works in progress needing attention! This is the first to cross the finish line. Also: I still have some Christmas/holiday cards for sale if you are interested, featuring the image below. They are 5.5 x 5.5", printed on glossy stock: 5 for $12, 10 for $20, plus $5 shipping (envelopes included). Let me know if you're interested! Last but not least, I have a holiday show coming up in my home, December 8 to 10. Details to come! Greetings from the bottom of the slippery slope! Thanks to all who followed my daily art journey. 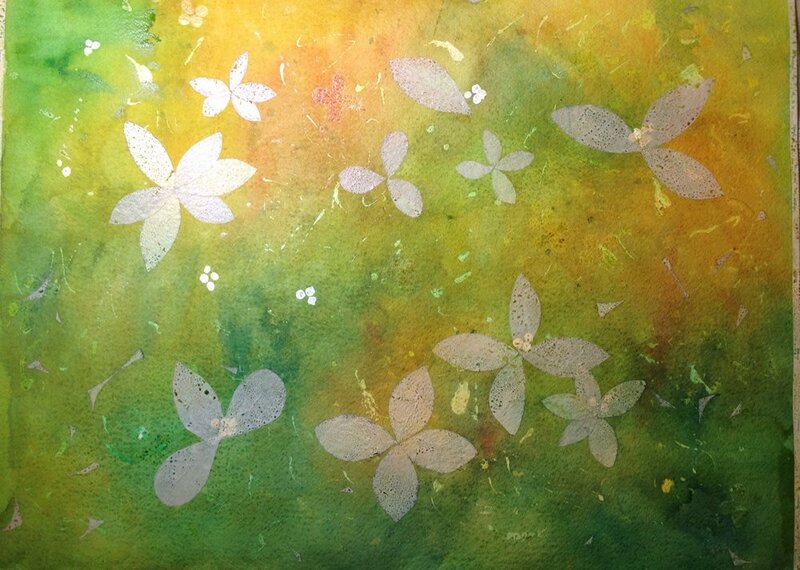 I have let my daily art project slide lately, although I have been very busy doing art-related things! I haven't decided how to proceed, vis-a-vis my blog, etc. More on this later. But for now, I did do this is my art journal today, during (and after) a concert I went to in Trenton by the Durham County Poets. I have given up on the trees for the moment, but this one should be ready in time for the weekend! My whole house was my studio today! By the way, I had good news today: my painting "Venetian Pear III" sold at the Colborne Art Gallery. Hurray! I think this might be finished now. "Wildflowers". Watercolour, 19 x 24"
Hello! I'm back in the land of Wi-fi. 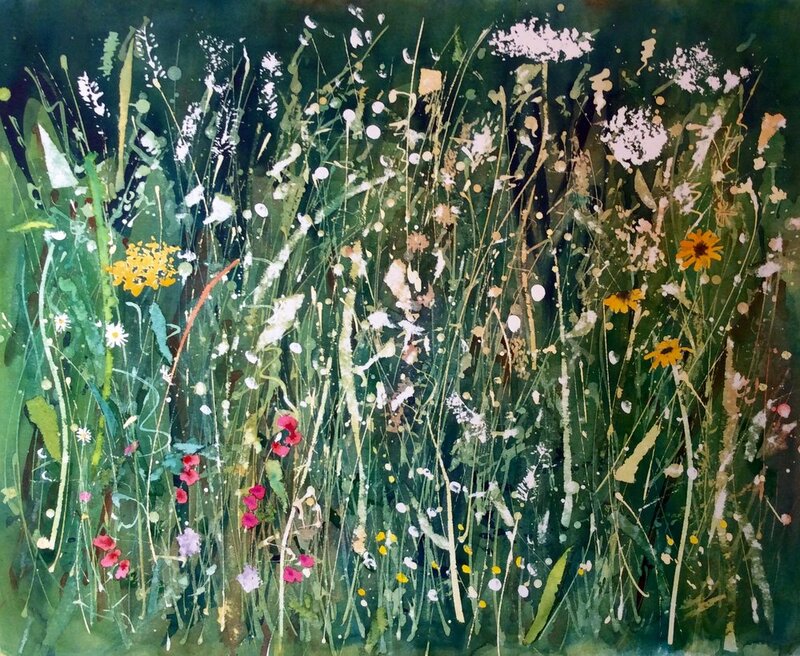 While still away in cottage county the past few days, l have been adding layers to this, another wildflowers watercolour. Today I peeled off the masking and was left with this. Not sure I will be able to resolve this one... but we'll see! "Roadside Wildflowers". Watercolour, 12 x 16"
This was another experiment, trying my "resistance painting" technique on a new subject (wildflowers, grasses, etc., as seen along a country road). "Midsummer Woods". Watercolour, 21 x 14"
This is another one of the watercolours I've been working on at the cottage this week. It's inspired by looking into the woods as I walk along the road. I haven't been posting my "art of the day" online, but I have been working on this painting daily. Today I spent most of the day on it. 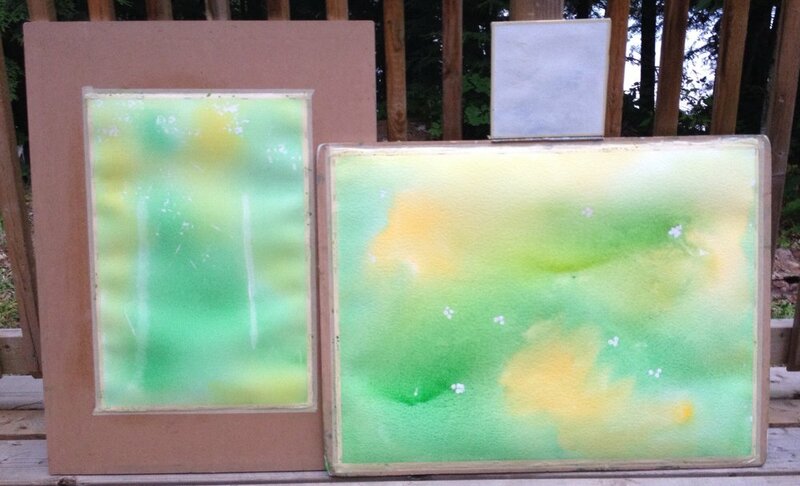 I am at the cottage, and I now have three watercolours on the go. If I don't use up all my cellular data, I will get back to my daily posting! 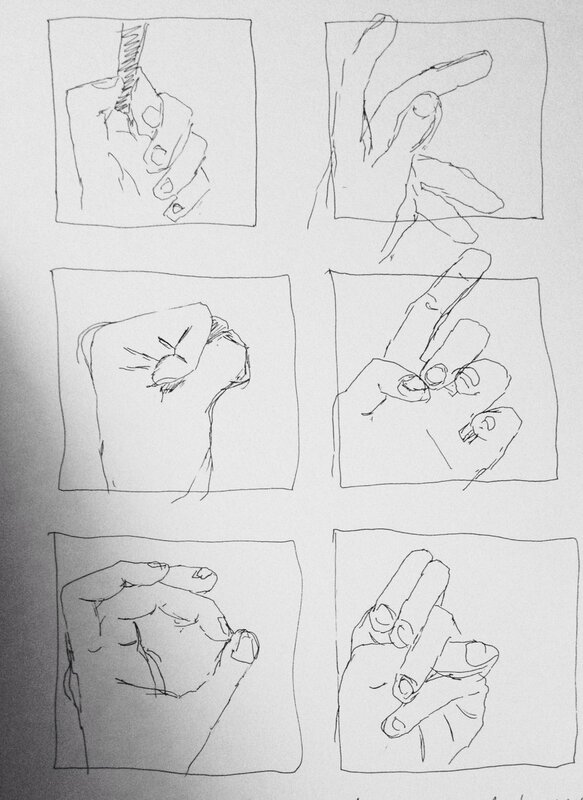 Quickie sketches of my left hand.